Kensington Collection backless park bench, precision crafted for aesthetics and for a lasting performance. Featuring contoured soft lines, the classic yet advanced stylings of this collection are prominently displayed by the rolled 1-1/2" steel vertical slats. 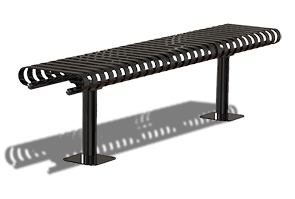 Engineered to maintain their original appeal and form throughout continued exposure to seasonal elements, each bench is MIG welded and finished in an ultra-resilient powder-coating. Designed to maximize structural stability with an ultra-durable 12-gauge, 2-7/8" steel tube frame configured specifically for either in-ground or surface mount installations. These premium backless benches are popular for individual placement and large scale multi-site applications with matching park benches, trash receptacles and picnic tables from the Kensington Collection.